Palo Alto is home to some of the best restaurants in the Bay Area, in many cases rivaling the best restaurants in San Francisco. It is a favorite dinner spot for locals living throughout Silicon Valley and visiting tourists and business people from around the world. Most of the best restaurants are relatively small and independent, and without reservations you can expect to wait up to an hour or longer, especially on weekends. Visitors looking for familiar but quality food will find lots to choose from. Chains including The Cheesecake Factory, California Pizza Kitchen, P.F. Chang's, Max's Opera Cafe, Il Fornaio, Gordon Biersch and Buca di Beppo all have Palo Alto locations. Restaurants are the focal point for nightlife in Palo Alto, and it's not uncommon for them to still be seating customers at 10 or 11 o'clock on weekends. A popular bar scene consisting of mostly non-local young professionals and some Stanford students keeps downtown Palo Alto going until after 1 a.m. A few restaurants and bars feature live music or DJs. For live theater, check out TheatreWorks, a nationally-acclaimed group that draws from throughout the Peninsula and Silicon Valley. Palo Alto Players, a popular community theater group that was the Peninsula's first theater group when formed in 1931, offers a regular schedule of plays at the Lucie Stern Community Center in Palo Alto. The much-loved Palo Alto Children's Theatre has it's own dedicated stage at the community center and has ignited the acting passion of many local children. Check the calendar for other theater, music and dance offerings in Palo Alto and at Stanford. 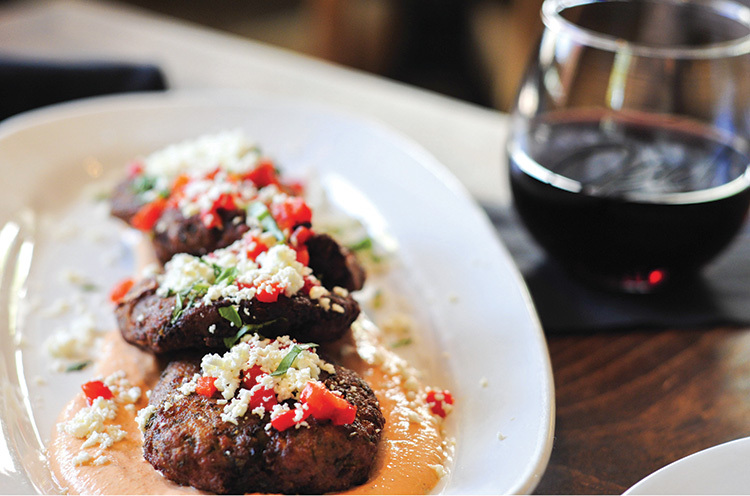 View a PDF of a useful listing of restaurants published in our printed Visitors Guide. Looking for a good place for a weekend brunch? These restaurants offer special brunch menus. Want to limit your search to the places our readers selected as "The Best?" These restaurants, cafes and eateries were the winners in our most recent "Best of Palo Alto" contest. Large portions of Italian food and a formidable pasta selection, but dishes are often bland. Desserts can be hit-or-miss, but the coffee gelato is deliciously reminiscent of the gelatos of Florence. Calafia is Charlie Ayers' contribution to the revival of Palo Alto's Town & Country Village. Formerly known for feeding Google and the Grateful Dead, Ayers has a hit in this sensibly priced, enjoyably furnished restaurant. From tofu scramble to braised pork, the food is good and the menu is the soul of diversity. Pacing is problematic but servers are friendly and eager, and the ambiance sets the bar for environmentalism. A trendy build-your-own burger joint that allows diners to pile their burgers high with such toppings/cheese/sauce as horseradish cheddar, peppercorn steak sauce, scallions, honey-cured bacon and ginger soy glaze. Milkshakes and some other sandwiches are also on the menu. A "burger in a bowl" comes without the bun. Onion rings excel. High-quality Venezuelan coffee and chocolates are among the highlights of this cafe. Among the most authentic and interesting items on the menu are the arepas, cornmeal pancakes stuffed with various ingredients, from traditional Venezuelan meat stew to smoked salmon to guava jelly. The cafe has also opened a location on the Stanford University campus, at 473 Via Ortega; its phone number is 650-331-1132. Darbar often wins Best Indian Restaurant in the Weekly's "Best of Palo Alto" reader poll, and deserves it. It features good service, value (including a weekday buffet that is one of Palo Alto's few lunch bargains) and a wide-ranging menu that does chicken particularly proud. The North-South Indian menu takes a vegetarian-centric approach, and portions are generous. Douce France ("sweet France") is chock-full of decadent dessert and breakfast offerings. Try a two-bite mini tart with blackberries or blueberries and custard -- or anything else from a huge array of eclairs, cookies and cakes. Sandwiches are pricey but oh-so-French, featuring such ingredients as creamy mozzarella, smoked ham and oven-roasted turkey. And when it comes to salads, Douce France pays attention to the details. Exciting Greek cuisine amid a rustic yet stylish Mediterranean decor. The room features large wood tables, wood-fired ovens and colored bottles on the walls. Mezethes (appetizers) are particularly good. Moussaka, lamb chops, lamb shank, quail and seafood excel. Desserts are heaven-sent. Knowledgeable service. Excellent wine list. Noisy and busy; reservations recommended. East Coast-style decor with a nautical motif and polished brass. Large fresh fish selection, grilled items, salads and pasta. Fleming's is a luxury steakhouse located in the Stanford Shopping Center. The decor is stylish, and the steaks, chops and seafood are delectable but pricey. Side dishes and appetizers are noteworthy, but service can be overly enthusiastic. More than 100 wines by the glass, and large bar.